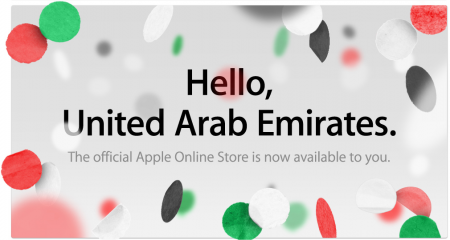 Apple has finally launched its first Online Store in the Middle East. The Emirates Apple Online Store is now open for business offering most Apple products including the iPhone (unlocked). You can also engrave iPods and iPads. Unfortunately these prices are a bit high compared to the US and Hong Kong Apple Stores. It’s even more expensive than the “official” Saudi prices. A commenter on the Arabic site said be bought a MacBook Pro for 4999 SR but it cost AED 5299 in UAE. The UAE Apple Store offers free shipping for orders more than AED 520. The Saudi Arabia Apple Online Store is expected to launch in December, sources claim. In addition to the UAE Apple has also launched an Online Store in The Czech Republic, Hungary and Poland. I hope they don’t charge taxes. im very excited about this!!! cant wait for the december lunch. Thanks Steve!!! hey how about the FaceTime? any news on FaceTime on Saudi Arabia? How can you be excited with this? Its overpriced and better to buy it online and ship it via aramex. What about purchasing from Canadian Apple Store Online ?? I think it’s the cheapest and the iPhones sold there are factory unlocked !!! But for purchasing from there one needs to have a shipping address in Canada. How can we get it shipped to KSA ??? Is there any update on this news? Is it still December or shifted to Next year December ?